Late May snowstorm? 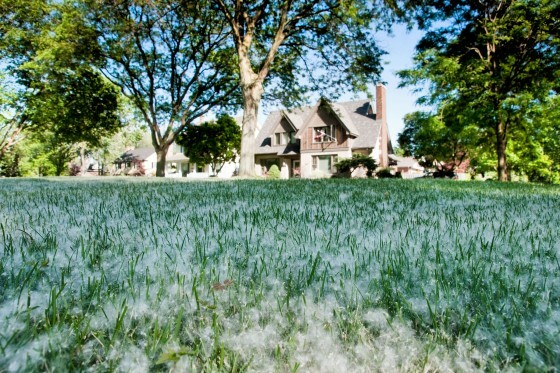 Nope, it’s just the time of year for poplar fluff! You might’ve noticed the waves of white fuzz blowing through the air in Windsor over the weekend. Balsam poplar trees (known in latin as Populus balsamifera) produce what many people associate significant seasonal allergic reactions with. Poplar fluff is a momentary nuisance, usually only blowing around, distracting drivers for a few weeks in late May / early June each spring. Many often suffer from the blowing fluff, coming down with allergic reactions including itchy, watery eyes, running noses, scratchy throats and sinus pressure. However, don’t forget, grass pollen is at a moderate high right now. Battle of the Sexes? Weather.com concludes that only Male trees are to blame, producing pods that break open, releasing tiny seeds connected to long white hairs (fluff). If you suffer from allergies, stay safe, back away from the fuzz. And don’t go sticking your nose into a lawn’s worth of fuzz just for a photo (like we did)!